As we age unfortunately so does our skin. Collagen, which helps keep our skin plump and firm slows down production year on year causing our skin to lose its elasticity and fine lines and wrinkles to appear. But don’t despair, we have an exciting new treatment to combat ageing for you! What’s this then? Radio frequency is the new celebrity go to treatment to combat ageing. The treatment uses a warming handset to deliver waves of energy into the skin, stimulating the body to produce new collagen. The treatment is described by many as feeling similar to a hot stone massage. Radio frequency treatment also realigns elastin fibres deep within the skin, tightening and strengthening the skin and tissue. We recommend radio frequency from your late twenties onwards. Skin usually begins to sag and lose collagen from this age, and every year our body will produce about 1% less collagen. Radio frequency will encourage collagen production keeping skin looking youthful for longer. 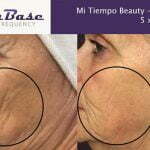 Results from a course of SkinBase Radio Frequency are instant. Tightening of the elastin fibres occurs immediately, giving an instant visible result. 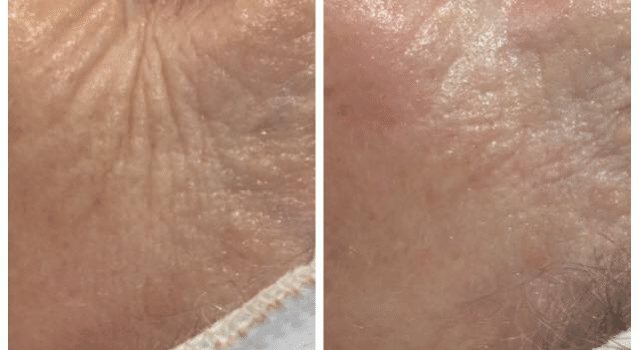 Over the medium term, you will benefit from increased collagen production for up to 3 months after the course has been completed. Long term, results can last up to 2 years making this treatment serious competition for Botox™. Growing numbers of salons are offering SkinBase treatments, to find a stockist in your area please contact us here. Image: Courtesy of Seaview Beauty Clinic results shown after 2 radio frequency treatments.